Have a question? Check out this list of our most commonly asked questions. If you didn’t find the answer or need assistance, we’d be happy to help! Click HERE to get in touch! How long has The New You Plan been around? Julie-Ann established The New You Plan in October 2009. Having experience of a TFR diet herself, she wanted to help others achieve their weight loss goals in the same way. Her ethos is to help people to do this by giving them the tools, support and motivation to actually achieve what they set out to do. Since then, The New You Plan has gone from strength to strength and has become one of the fastest growing weight loss companies in the UK and Ireland. Is this plan similar to other TFR/VLCD diets? The New You Plan diet works on the same principle as other weight loss companies. However, with some companies, once you place your order, that’s the last you’ll hear from them until you’re about to run out of products. Here at The New You Plan we strive to offer the best in service and aim to be with you every step of the way. Whether you’re feeling on top of the world as you get closer to your target or are having a bad day and everything seems to be going wrong, we pride ourselves on being there for you. Is The New You Plan governed by official guidelines? The New You Plan offers an extensive online support network for all of our customers. This includes tools such as our 7 Day Kick-Start Video Coaching Programme and the excellent Secret Slimmers group on Facebook. You are never alone when you are part of our plan. You are also able to contact us by phone, e-mail or through Facebook and we will be happy to help with any of your queries. Why The New You Plan? Not only will The New You Plan give you quality and choice of products at a great price, we will give you the best support in the industry. Whether you are on our Secret Slimmers group on Facebook or calling our office on a Monday morning, you will receive the best support, motivation and help available. We never just leave you once you’ve placed an order; if you want us we are here. Speak to one of our friendly staff now. Are VLCDs suitable for everyone? The New You Plan strongly advises that you should always seek and follow the advice of your doctor or health professional before starting on a Very Low Calorie Diet. BEFORE STARTING THE DIET PLEASE ENSURE YOU FOLLOW OUR PRE-START CHECKLIST. Do I need a doctor’s permission to start? We are unable to give any medical advice and would always advise that you speak to your doctor before commencing a TFR/VLCD diet. This diet works through rapid weight loss by ketosis. All of our products are nutritionally balanced meaning they have been scientifically produced to contain all the nutrients, vitamins and minerals required to stay healthy. Both men and women should consume 4 of our TFR/VLCD products per day and this provides 100% of your recommended daily allowance (RDA). The body usually uses food as its primary source of energy. Ketosis is the state that your body enters when it is using your body fat as its main source of energy. When starting a VLCD, the body initially uses up its energy reserves of glycogen. This is a process that normally takes 3 to 4 days. When the glycogen stores are used up, the body then switches its main energy source to body fat. When fat is burned rapidly the body produces something called ketones and the person is said to be in ketosis. Constipation is one of the most common side effects of being on a VLCD. This is not to be confused with the fact that you are eating a lot less food. There is simply less wastage for the body to dispose of. However, there is the chance that constipation is the reason and this could be because you have not drank enough water regularly and have become dehydrated. Ensuring you drink the recommended amount of water will help. We also sell Feiyan Tea – a natural Chinese tea – which can help in this situation. However, if you are suffering from some discomfort it may be worth visiting a chemist and asking what they would recommend. You may experience headaches. Regular pain killers and drinking extra water will help. Some people experience feelings of nausea or an upset tummy. This could be due to the high concentration of vitamins and minerals contained in the replacement meals. Drinking water before, during and after eating can ease this. You may suffer from the occasional cramp when on a VLCD. This is generally caused by fluid imbalances in the body’s tissues. To help solve this the remedy is quite simply to drink more water. Adding a pinch of salt to your New You soup or meal may also help. Ladies may notice a change to their hormonal cycle when they lose weight. This is caused by a slight change in the hormonal balance of the body and could affect the flow, duration or frequency of periods. One of the rarer side effects that a VLCD can have is hair shedding/thinning. Please don’t worry – this is temporary and is caused by the shortage of calories, causing the body to slow hair regrowth. Again, this is temporary and will return to normal following the reintroduction of conventional food. You may notice that you suffer from bad breath and possibly a metallic taste. Ketosis causes a type of acetone to be released in the breath but this normally improves as the body settles down. Drinking plenty of water can dilute the acetones and maintaining good oral hygiene will also help. There is no real answer for this one. Each person is unique and as such weight loss is a very individual thing. There is certainly no exact science to it. However, if you check out our blog you can see some of our amazing success stories. How long can I stay on the diet? According to industry guidelines if you plan to stay on a VLCD for a long period, you should only remain on it for a maximum of 12 weeks and should then have a break for a minimum of 2 weeks. There is no problem with going back on the diet but you always need a break after each 12 week period. This is simply due to the fact that your calorie intake is so much lower than usual that this is the maximum length of time any VLCD remains healthy. Ideally you should be drinking between 2-4 litres of water throughout the day (please bear in mind it can be dangerous to drink large volumes in small periods of time which is why we recommend spreading it throughout the day). This is essential to ensure the body is performing properly and healthily. If you do not drink enough you may become dehydrated and this could lead to headaches, dizziness, issues with blood pressure and constipation. As with most things the amount each person needs is different so this is a guide. Can I exercise whilst on the diet? There is nothing wrong with exercising whilst on the diet; in fact we would encourage it. However, it may take your body a week or two to enter and adjust to ketosis so we would recommend taking things fairly easily to start with. Something like a walk is fine but try not to do anything too intensive. Once your body has adjusted most people tend to find that have more energy than usual and are able to do even more than before they were on the diet. You can read some handy exercise tips here. For anyone who participates in exercise already, simply adjust your routine accordingly. Can I use a mix of your products with conventional food? While most of our customers do the full VLCD diet, you are able to use a mix of our products with conventional food. The only thing is we cannot guarantee is that the conventional foods you choose to eat will help get or keep you in ketosis so it may slow weight loss down. However, if you would like to take things slower or indeed even maintain your weight once you have reached your target, this could be an ideal way of going about things. Please bear in mind that we would always recommend a healthy, balanced diet when referring to conventional food. Is it ok to have diet drinks? We would not recommend drinking any fizzy drinks whilst on the diet. This is mainly due to the fact that if there is fruit or citric acid present, it could knock you out of ketosis. Any tea from a leaf is absolutely fine. However, avoid any tea made from a fruit or flower as these could affect ketosis. Avoid adding milk or sugar as again these could affect ketosis. Can I use sweetener in my tea/coffee? You certainly can. However, you should avoid the powder form of sweetener and stick to the tablet form. Can I add milk to my tea/coffee? We would recommend that you don’t as the slightest thing can knock you out of ketosis. However, if you simply can’t manage without, then just a splash of skimmed milk could be used (a maximum of 250ml per day). Can I drink alcohol on the diet? It is not recommended to drink alcohol whilst on the diet. This is because alcohol provides unneeded energy and means the body is using this instead of fat stores. This could cause the body to come out of ketosis and slow your weight loss. Not only this but alcohol can cause dehydration and lower blood sugar which will cause hunger and the possibility of giving in to temptation and undoing all of your hard work. Can I use chewing gum? We would not recommend using chewing gum as you can never be too sure what ingredients have been added that could knock you out of ketosis. This is absolutely fine. Tablets such as paracetamol and aspirin will not affect ketosis. Please bear in mind that headaches can sometimes be caused by dehydration so if you haven’t been having the recommended daily amounts this could be why. Our products are scientifically formulated to provide 100% of the recommended daily allowance (RDAs) for vitamins and minerals. As long as you are sticking to the diet and consuming the 4 TFR products a day there is no need to take a multivitamin on top. If you suffer from any kind of deficiency however, we would recommend that you speak to your doctor and get their advice. Why has my weight loss stopped/slowed down? There are numerous reasons for weight loss to stop or slow down. The most common is when someone eats or drinks something not recommended. You would be surprised how such a small amount of something you would see as innocent could knock you out of ketosis. Another common reason is water retention. If you are not drinking the recommended amount of water, the body will retain what it gets and also if you have an infection the body requires water in order to fight it. Water retention can also occur in ladies around the time of a period. If you are suffering from constipation, this can also be a cause of stopping or slowing weight loss. The above are the most common causes but there may be other factors involved. If you are ever really concerned then please seek medical advice. Please remember though, weight isn’t everything. Muscle actually weighs more than fat so if you notice that you are still toning up or your waistline is getting smaller for example, you are probably still losing body fat. To maintain your new slim figure it is strongly recommended to introduce conventional food as slowly as possible so as not to overload the body too quickly. This could be a case of going from 4 products a day to a healthy breakfast and 3 products a day for a few days, then a healthy breakfast and healthy dinner with 2 products a day for a few days and so on. You can also join our Momentum Maintainers group on Facebook for handy tips and hints from people who will be doing the same as you. At all times we would recommend a healthy, balanced diet. Will I put the weight back on when I return to conventional food? There is no reason anyone should put weight back on when they return to conventional food other than that of the return of glycogen stores to the muscles. The important thing is that you have healthy balanced meals and don’t go back to old eating habits that led to your weight gain originally. Exercise will also help in maintaining a healthy lifestyle. You can find some handy exercise tips here. What is the New You Reward Scheme? The New You reward scheme is a way of us saying thank you to our customers. 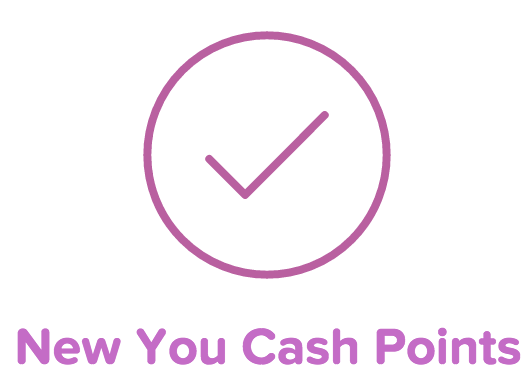 You can collect points in 2 ways: earn points for every pound you spend and earn points for everyone you refer to The New You Plan who successfully places their first order. You can use these points to get money off future orders. For every £1 you spend (or euro equivalent as per the exchange rate on our website) you will earn 1 point and for every person you successfully refer to The New You Plan you will earn 500 points. Every point you earn can be used to get money off future orders. Each point is worth the equivalent of £0.01 which means that if you collect 100 points for example, you will get £1 off. If you successfully refer a friend you get 500 points – that’s a massive £5 to use on a future order. There are a few ways you can do this. Every customer has a unique referral code. This can be found on your account page on the website under the Recommend a Friend option. In the Recommend a Friend section you will see a simple email tool where you can enter the email addresses of your friends, click submit and a referral email will be delivered to their inbox. All they need to do is follow the link in this email, place their order and that’s it done. Alternatively you can pass your unique code to your friends by hand. To use the code in this situation, when your friend wants to place an order they simply enter the referral code at the registration stage of the checkout (the code is case sensitive so make sure you tell them to type it exactly as it should be). The final way to refer a friend is on Facebook. To take advantage of this option, you should go to the Recommend a Friend section in your account area of the website. You will see a link that says “Click here to share your referral code on Facebook”. Simply click on this link and you can share with all of your friends (please note: if you are not already signed in to Facebook, it will ask you to do so). If I refer a friend will they get anything? Yes. When you refer a friend they will get 1000 points (equivalent to £10) as well. Once they have followed one of the referral methods, e.g. clicking on the referral link you sent in the referral email, £10 will be waiting for them at the checkout to use on either their first order or a future one. What if my friend doesn’t enter a referral code or follow one of the links I send? In order for the referral to process through the system, everyone who is referred must use one of the correct pathways otherwise the points will not filter to your account and your friend won’t get their discount. If you have a problem sharing your code please watch this video for more info. Our products are extremely good value and we have created discounts that help you to save money while you lose weight. The more you buy, the more you save. We also have regular special offers and promotions to help our clients to achieve their weight loss goals at an affordable cost. For all of our current prices please visit our shop. We accept all main credit and debit cards (including Irish Laser). You are also able to pay using PayPal when placing your order online. Can I return products for a refund or exchange products? In line with Distance Selling Regulations regarding perishable items, we do not offer refunds or exchanges on food products. Non-food items may be returned as long as they are returned unopened and are re-saleable. Standard delivery time is next working day within the United Kingdom and the Republic of Ireland. Delivery to remote areas in the UK can take up to 3 days. Should you need to query this please contact us for help. Please note that orders placed before 3pm weekdays are dispatched on the same day. Orders placed after 3pm will be dispatched on the next working day. Any orders placed after 3pm Friday, on weekends and on public holidays will be dispatched on the next working day. As with all deliveries, factors outside of our control such as weather can affect delivery times. However, we would advise all customers that they should receive their packs within 3 working days. We would expect delivery to be quicker than this, but we ask that you allow this amount of time when placing an order to avoid running out of products and to allow for any postal issues so as not to be disappointed. If you live outside the UK and Ireland and are interested in placing an order, please contact us for more information as prices and timescales will differ considerably depending on location. When your order is dispatched, you will receive an e-mail from us informing of such. Depending on your location, your pack will be with you within 3 working days at the very latest, usually sooner than this. If your delivery is taking longer than you would expect or indeed if you are concerned about it please don’t hesitate to contact us and we’ll be happy to help. Can I collect my pack from your office? You are more than welcome to drop in and collect your order from us. Simply select the option to collect from us at the checkout and the rest will happen automatically. Please note this function is only set up for BT post codes as we are located in Northern Ireland. Yes. All of our orders come packed in plain packaging and none of our colours or logo are visible. What products should I have? It is entirely up to you. As long as you are having 4 TFR products a day it doesn’t matter which ones although we would only recommend a maximum of 1 bar per day (some customers find that a mainly liquid – shakes and soups – diet gives the fastest weight loss). Some people prefer to have just shakes whereas others prefer to mix it up. The best thing to do is find what works for you. You can also enjoy products from our tasty snack range. We would recommend that these are only used as treats or if you are struggling on a particular day. They can bring a little variety to your week as well. Ideally you would have a maximum of 2-3 of these per week. Are there particular times I should have my products? You should try and have your products at times that are convenient to yourself. Obviously everyone is different and we all have different routines involving work etc, so it really is a case of finding what works. Try to spread your eating times throughout the day as this will help you get into good habits for when you start back on conventional food again. All of our products are suitable for vegetarians (with the exception of the wafers) and even those which sound like they may contain meat are made with a meat substitute. What allergens are in your products? Each product is different and you are able to view specific allergen information by visiting the individual product pages on the website. If you have any difficulty finding this information then please watch this short video that will show you where to find it. If you prefer, you can contact us for specific information on a particular product via e-mail or phone. Can I add any herbs/spices to my products? You can add herbs and spices such as chilli powder to your soups and meals if you would like to add a little extra flavour. A lot of our customers also like to experiment a little with our products such as adding mint tea to their chocolate shakes. This can add a little variety to your meal time. If you are unsure if something could affect your ketosis feel free to ask. How come there are sugars in these products? I thought to get into ketosis you should avoid carbs. Carbohydrates are an essential part of the diet and as such this is not a carbohydrate free diet. All of the products have been scientifically formulated to have the optimum levels of each nutrient, vitamin and mineral to ensure every customer remains healthy while on the diet. Any more than these amounts could well affect ketosis. Hi, I was just wondering if you can maybe use almond milk or soya milk in my coffee? I love my coffee and i have tried to use skimmmed milk but it definitely slows down my weight loss. Hi Karis, thank you for your message, in relation to what you can and cannot drink. Drink 2.5 – 4 litres of water steadily throughout the day. Tap water, bottled still water and sparkling water are all fine, but NO flavourings other than the ones you find on our site and NO slice of lemon! Teas and Coffees are included in the water allowance. Teas can be black, white, or green leaf but not from flowers or fruit. Specific to what you have asked here regarding milk – it is advised to avoid drinking milk with your tea and coffee, however if you want to have the occasional cup of tea or coffee with milk use skimmed milk only and never exceed 250mls per day – if you had exceeded this, it may have been the cause for your weight loss slowing down. Black is best for Ketosis.In terms of the Almond milk – this is not in our guidelines. Some of our customers would use unsweetened Almond Milk and they have found that it does not affect ketosis or weight loss. Artificial Sweeteners in tablet form are allowed in teas and coffees. Do NOT use the powder form of sweetener. Thank you for the message – the amount of calories varies from meal to meal, however the plan is designed so that any combination of 4 products will be lower than 800 calories per day which is why we are classed as a VLCD – very low calorie diet. If you need to know the specific calorie counts for each product then you can find the nutritional information at the bottom of each product page, or alternatively if you are in a bundle then you can simply hover your mouse pointer over the blue ‘i’ below each product and you will get a basic breakdown of each product. You say in your comments so flavours in water. What about the flavours ye sell? Hi Trina, thank you for the message. I am happy to say that our water flavours are ketosis friendly so you can use these as part of the plan. In fact the actual water flavours contain added fiber to help keep you regular. Hi, i was just looking at some of the questions and noticed that you say No to a slice of lemon in water, why is this? Can you add zero or slim noodles to the dinner meal packs to bulk them up. Thank you for the message Carol 🙂 for best effect we recommend sticking to the plan 100% – however these are ketosis friendly and therefore you can add them to your meals if you wish. You can also add green vegetables, a pinch of herbs and spices to taste. Good luck and please feel free to email me on [email protected] if there is anything at all I can do for you. I was just wonderng if there was anything else i can eat when doing this diet. I started yesterday and i used to eat a lot so not always full up after one of the meals. Of an evenig would it be ok to have my own snack such as a piece of fruit? or fat free 0% yoghurt? Hi Kelli, thank you so much for posting. Our diet is ketogenic so if you plan to follow it 100% then you do need to be careful what you add to it. For instance the fruit would have a lot of natural sugars in them. Also even with a yoghurt being fat free it may have sugars in it to. Therefore if you are trying to stick to the plan, we suggest either having an additional pack if you need to or you can add green vegetables to your meals to bulk them out slightly. Also if you drink a full glass of water at meal times this also helps – more often than not your brain is not catching up with how you feel so by the time you do feel full it is sometimes too late. I hope this helps and if you have any other questions please feel free to email me on [email protected] and we be back in touch as soon as possible. What about if I’ve only had 3 meals will I still loose weight?.. Thank you for posting Jackie, the minimum number of meals you can have in a day on our fast focus plan is 4 as each product contains 25% of what your body needs in order to remain fit and healthy. The number of products you have in a day is dependant on weight. People under 17 stone have 4 of our TFR (total food replacement) packs each day while people over this weight have 5 meals per day. I hope this helps and if you need any further help please feel free to email me on [email protected] – I would love to help you get the most out of our plan and smash your weight loss goals. Hi, I’ve just finished doing my first week of a Vlcd. But I’ve been doing it with a different company; shake that weight. I’m having a 5th pack Instead of the milk allowance. which they say is okay Coz it’s still less than 800 cals a day. But day 6 and 7 have been hungrier than the others. I’m finding it hard. I’d like to swap over to you just because you have so many success stories. But I don’t know how I’d cope on 4 packs. I know yo say I can have a 5th pack with you too and it shouldn’t knock me out of ketosis. But should I Really be hungry on day 6 & 7?? On average, what is the daily carbohydrate intake when on this diet? On a basic ketonic diet it states no more than 100g. I’m over 17 stone so it looks like a can have 5 shakes/soups A day. Once I’m under 17 stone do I reduce to 4? I did lighter life and lost 5 stone but I think I’m going to struggle with not eating anything with the family. Can you explain how the other plan works where I could have one meal a day. Also the pineapple drinks/ snacks how many would I be able to have of those. Thank you. Thank you so much for posting Nicki – in terms of your question about the number of packs per day – this is correct in that you have 5 TFR packs per day and then when your weight drops below 17 stone then you would drop down to 4 TFR packs per day. In terms of the plan that includes a healthy meal this is known as our family focus plan. This is done in the same way as the Fat Focus diet however you change one of our packs out for a healthy low carb meal. Should you wish for us to cover this in more depth please feel free to email me on [email protected] and I will do my best to help you. Look forward to chatting soon! Hi just wondered is the pineapple fat burner class as 1 of the 4 meals or can you have this aswell as? Thanks for posting Lisa – the Pineapple Fat Burners are not a food item and therefore they are used in addition to your meals each day. You can have 1-3 of these per day depending on your needs. I hope this helps and if you need any further support please feel free to email [email protected]. Just curious would I be able to add black pepper or cayenne pepper to the meals? And by adding any of the spices would it bring you out of ketosis. I am happy to say that you can use herbs and spices with our meals – please avoid adding salt though as this would affect your results. For further assistance please email [email protected] or refer to the documents found in our Secret Slimmers group in Facebook. Hi Maxine 🙂 thanks for the message it is lovely to hear from you. You are best avoiding chewing gum as this can affect ketosis and create cravings for sugars – drinking plenty of water should help with the bad breath. Also you can Listerine Original Mouth Wash and their Cool Mint Breath Strips which are available through Amazon online. Also flossing, brushing your tongue and practising over all good dental hygiene will reduce the impact of ketosis breath. I am my second week into plan. I lost 5.5 lbs the first week which is great but i was a bit disappointed as I followed the plan 100% and was hoping for a wee bit more. I am putting it down to the fact that I may have gone over my skimmed milk allowance as I wasn’t measuring. My question is that I read on secret slimmers that I can have 2 cups of bouillon a day if i’m feeling a bit hungry inbetween my shakes. is this correct and if so is the ‘just bouillon’ chicken flavour purchased from supervalue ok to be using? Thanks for posting and well done on your first week. 5.5 lbs is actually a good result – every person is different so dont get stressed out if you see people with higher losses they will have different circumstances to you. In terms of the savoury drink it is best to stick to the reduced salt version of the Marigold Swiss Vegetable Bouillon Powder and do just have a couple of cups. If you need any further help please get in touch by email on [email protected] and you will find loads of helpful tips in the files section of Secret Slimmers in terms of tips and tricks – things you can and cannot have. Good luck and we are always here for you. Is this plan suitable for gluten and dairy free as I am allergic to both. Hi Alex, thanks for posting. We do have some gluten free options however sadly this plan is not suitable if you are allergic to dairy. I would recommend speaking to your GP to see if you can get a referral to a dietitian as they can help you achieve similar results with conventional foods the only downside is it will be a bit more expensive and not as convenient but neither of these should stop you if you are dedicated to living a slimmer, healthier life style. Good luck and please feel free to email [email protected] if you need anything else. My 4x meals.have I come out of ketosis.I’ve acquired boundless energy and no hunger.Great plan.Thank you.Gina. Hi Gina, the wafers would have very little impact both on ketosis and your weight loss results if you stick to the recommended 2-3 per week. Hi Can I drink mint tea? Thank you for your message, please find below the requested information in relation to what you can and cannot drink. fine, but NO flavourings other than those purchased on our site and NO slice of lemon! Milk – it is advised to avoid drinking milk with your tea and coffee, however if you want to have the occasional cup of tea or coffee with milk use skimmed milk only and never exceed 250mls per day. Black is best for Ketosis. Please note all hot drinks consumed with your milk allowance will not be counted towards your daily water consumption. I would also suggest joining our Secret Slimmers Group on Facebook for fantastic support and advice. I would love to get you into our Secret Slimmers group, there are two ways I can do this for you. Either I can email you an invite if you confirm the email address you use for Facebook or alternatively if you add me as a friend on the link below I can add you into the group. I have just completed 2 days maintenance following an 11-week TFR, on the NewYou plan. Can I still take NewYou snacks during the maintenance period? Thank you for your message, it is lovely to hear from you. It is absolutely fine to use New You snacks during the maintenance period as long as you are following our refeed guide. You can further maintain your weight loss by using our plan in the 5:2 version so this will help keep you at your goal. Please feel free to reach out again if you have any questions. Thank you for your query, it is lovely to hear from you. In terms of your question, our water flavourings are unlimited and count toward your daily 2.5-4 litres of water per day. Please reach out if you need anything else.